Slightly surprisingly we’ve been in our “new” house for 6 months now so it seemed a good time to take stock and assess the situation. It’s also a good point to take the time to appreciate everything we have and how lucky we are to have it. We made a seemingly minor decision during the first month or two to occasionally leave broody hens to hatch batches of eggs. However after the first three sets of chicks arrived we quickly realised that we had reached full capacity on the under-productive white chickens that we inherited on our arrival here. The first batch of chicks that hatched yielded just 2 – one male and one female – so the cockerel soon became the volunteer for our first attempt at killing and eating our own chicken. Through the summer we found that it was just too much like hard work to find out if and where they’re laying eggs despite our efforts with fencing them in and generally improving the facilities provided for them. Next spring we’ll give the existing flock another few months to prove themselves but if there’s no improvement then some extra point of lay hybrids will be brought in. 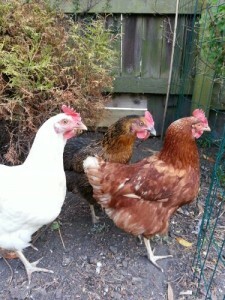 There is always the possibility of getting rid of the inherited chickens but right now that seems a little drastic. On reflection perhaps a “layers flock” in a separate dedicated area will mean the existing flock can be treated as meat birds. 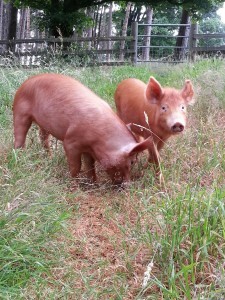 The huge success and enjoyment of our first foray into pig-keeping means that we will definitely be getting 2 or 3 weaners in Spring 2014. There is a temptation at this stage to go further next year by getting a couple of breeding sows but common sense should prevail and we’ll get more experience with weaners first. My preference would be for Oxford Sandy and Black weaners next simply based on their appearance but it’s just as likely that we’ll get whatever is available at the time locally to save headaches with transporting them. From everything I’ve read, Dexters seem to be a good fit for our requirements if we are considering a house cow but with no prior experience of this I think some practical training will be needed first. There is also a consideration about the amount extra time this will take and how we can best fit that in with all the other plans we have (as well as the day jobs). At least any excess dairy products could be used to cut the pig feed bill and ease the financial burden but as usual there are also plans to try cheese and butter making or even yoghurt if we’re feeling daring. Another appealing idea is to take on a few orphaned lambs from the local farmer and raise them for meat. However it might be better to wait until we’ve dealt with the pigs before deciding on that just in case we get too attached to them! Our friendly local farmer is always willing to make use of our paddocks and hay meadow for his sheep from time to time so we can fall back on that option. It gives us the chance to watch closely how the professionals do it before making any decisions for our own flock. The expansion of growing space should mean that more of each can be grown providing I can resist the temptation to just grow a larger number of varieties instead. Some of this extra space is already taken up with the onion sets and garlic but I have plenty more space and loads of ideas for next year! My first batch of rhubarb will need to be moved to a more permanent home after starting life with us in large tubs so they could be transported when we moved house. As luck would have it, the house we eventually bought already had some healthy looking rhubarb but I’m sure we can find plenty of ways to use up any excess. One of the great successes from the previous 6 months was the dwarf bean which were a freebie promotional packet of seeds but provided a good crop from a relatively small space. They will definitely be making an appearance again next year along with the leeks, carrots and beetroot. One lesson learned the hard way this year was to properly protect cabbages from butterflies – much as I like to see them, I’d rather eat my own cabbages than feed them to the pigs. 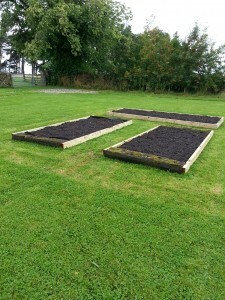 Needless to say, there are already plans to try some theories for removable netting covers for the new raised beds. Our new fruit trees (3 apple, 1 plum and 1 pear) should be arriving any day now but for the first year or so while they get established we will be removing any fruit that forms. I’m happy to make sure of a better future harvest in future years and encourage its energy into growth rather than expect fruit in the first year. All indications seem to be that they should survive in the North Pennines especially as the chosen spot is fairly well sheltered but still sunny (on a good day). It’s likely that any failures are much more likely to be down to my inexperience but preparations are well in hand including tree guards and stakes. Another fruit adventure is some soft fruit bushes which are due for delivery shortly – 2 each of blackcurrant, redcurrant and blueberry. That seemed a good variety of plants to try but, if space permits, we can always get more of those that do well over the next few years. We have already signed up for the installation of solar PV panels although for our situation these will be ground mounted in a field rather than on the roof. Although there is still the small matter of planning permission to get we’re reliably told that this has not been a problem on previous installations by the same company. With such a wide range of ideas and options running around my head, it’s sometimes important to step back and keep focussed on the main issues. However in my “spare time” I can dream up even more schemes with varying levels of realism for such things as a holiday let conversion, biomass heating system, main house refurbishment, tree planting, fencing/walling repairs and so much more. Jersey cows are about the same size as Dexters but will give you more and better milk, if you cross a Jersey cow with a Angus it gives very good meat. Yogurt is very easy to make if you have either a range cooker or an incubator, as long as you can maintain the mix at 40c for eight hours you will have a good set. The idea of getting a Dexter in particular came about because of concerns about not being able to cope with large quantities of milk but a Jersey was also an early option. We’re still only just thinking about it so there is plenty of time to change our minds especially once we learn about more ways of using the milk!